Jamie Oliver and Woods' Silver Fleet have joined forces to bring the television chef's catering to the event industry. From 16 August 2011 Woods’ Silver Fleet– including its flagship vessel the Silver Sturgeon– will serve Jamie Oliver’s menus on its Thames cruises. Oliver said that his event catering company will use British produce to create international menus, with on-deck barbecues. He added: "This is about using great food and service to create a relaxed atmosphere so guests can sit back and enjoy the food as they take in the scenery. I might be biased, but I think London is one of the world’s most beautiful cities, and, with the Olympics just around the corner, there’s no better time to celebrate British food, or London itself." Woods' Silver Fleet managing director Tom Woods added: "Our passions are boats and food. With Jamie and his new events team and the stylish, creative eye of designer Fiona Leahy, a party aboard the Silver Sturgeon or Royal Nore will be one of the most glorious places in London to enjoy delicious, honest food which reflects Jamie’s passionate personality." Event industry showcases are billed for late September. 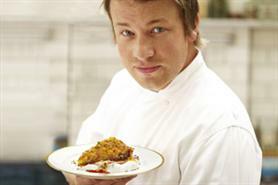 Jamie Oliver announced his entrance into the corporate events market last year.